Do you like art? What types of art do you like? Do you prefer modern art or classical paintings? Watercolor, acrylic, pencil, or another medium? How about oil pastels? Have you ever walked through an art gallery and tried to interpret the paintings there? Some years ago, I went to a local art gallery here to view a touring exhibition from the Louvre. Walking around, taking in the scenery, I was struck by the Rembrandt and Raphael paintings, among others. How does one attempt to read through the layers of a masterpiece by Raffaello Sanzio da Urbino? Even his simplified mononymous name of Raphael held no clue regarding the intensity of his artistic mind. How does one dissect the paintings and colors of Rembrandt Harmenszoon van Rijn’s artwork? God had given him artistic talents unparalleled even to this day. I remember staring at their paintings, reading the accompanying descriptions, listening to the audio guides, trying to catch glimpses of the artists behind the paintings and sketches. I didn’t go very far. I barely scratched the surface of the layers of paint and secrets lost to time. In the end, I simply enjoyed the paintings, thanking God for the gift of art. Sometimes paintings may or may not have hidden meanings. Well, tell that to Lars Cargill, an Englishman who visits Savannah one fine summer, buys a painting, and hangs it in his home. He is convinced that there is a real woman behind the painting. When Lars returns to Savannah, Draw You Near begins. This is Book 3 in my Savannah Sweethearts series of sweet, clean, wholesome, and inspirational multiethnic contemporary Christian romances celebrating faith, hope, and love in Jesus Christ. While on vacation in Savannah last year, Lars Cargill bought a small watercolor painting for his estate in England. The more he stared at the artwork, the more he wanted to meet the woman in the painting. This summer, Lars returns to Savannah to find the elusive real-life Lady and the Sea. Problem is, the artist says she doesn’t exist. Of course, he doesn’t believe her. Otherwise, he wouldn’t be showing up in her art classes and following her around. He doubts she has the heart to turn him away, not when he shows her that he has artistic potential. Abilene Dupree is busy trying to make a living as an artist and art teacher in Savannah. She sells commercial art, not personal stories. Although much of her heart goes into her paintings, she doesn’t reveal her soul, not even to the clean-cut guy with cute dimples who is searching for the woman in her Lady and the Sea painting. She keeps telling Lars that the illusive woman in the painting doesn’t exist. Well, the more she tells him that, the more she begins to believe her own words. Before she could give him the real answers he seeks, Lars’s own past shows up and he has to leave Savannah. What do you think Lars should do? Should he give up his quest? Should Abilene help him at all? To read what happens to them or to preview the first chapters, check out the links below. Happy reading! In all my Savannah Sweetheart stories, my two main characters are Christians who want to do the right thing. This time, Lars and Abilene come from two different continents. Will their hearts meet on the Atlantic shoreline? Or will they go their separate ways like an unfinished painting? What about you? Do you read a lot into a painting or an artwork? Are you more like Lars, who tries to find the deeper meanings beneath the layers of paint? Or are you more like Abilene, who doesn’t overanalyze herself or her artwork once she has completed the painting? Or are you a bit of both? Regardless of what your perspectives are, have a wonderful day in the Lord! 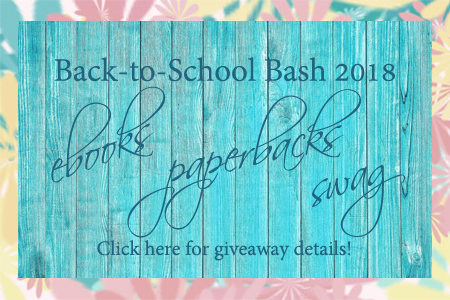 Prizes galore in our Back-to-School Bash now on! So excited another Savannah Sweetheart book is coming! I love this series! Thank you for sharing! Thank you, Paula Marie! This book, DRAW YOU NEAR, has been out for a while. It’s Book 3, and I am currently writing Book 7. 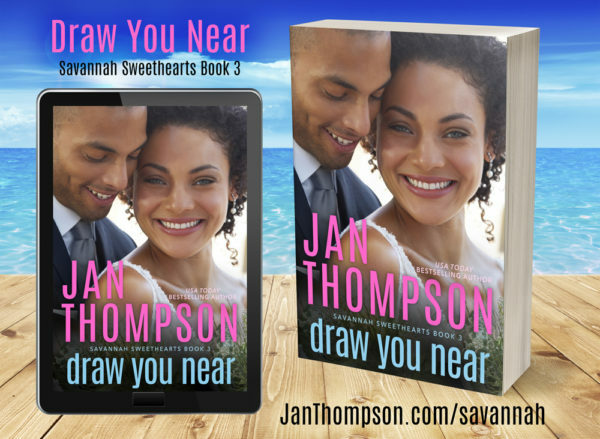 The entire series, Savannah Sweethearts, is set in the coastal town of Savannah, Georgia, and on Tybee Island, minutes from town. Hope you enjoy reading DRAW YOU NEAR! The next book after this one is called CHERISH YOU SO, which is the story of Abilene’s older brother. I’m new to the Savannah Sweethearts series but Lars’ search and belief definitely have drawn my interest. Thanks for the great intro!! Hi Jan! I have visited the Chicago Art Institute several times, but have never really overanalyze art, just appreciated the talent of the masters. While I enjoy Monet’s impressionism, I am not fond of modern art. I have read several novels about art: The Girl with the Pearl Earring and Aubrey Wynne’s Merry Christmas, Henry. 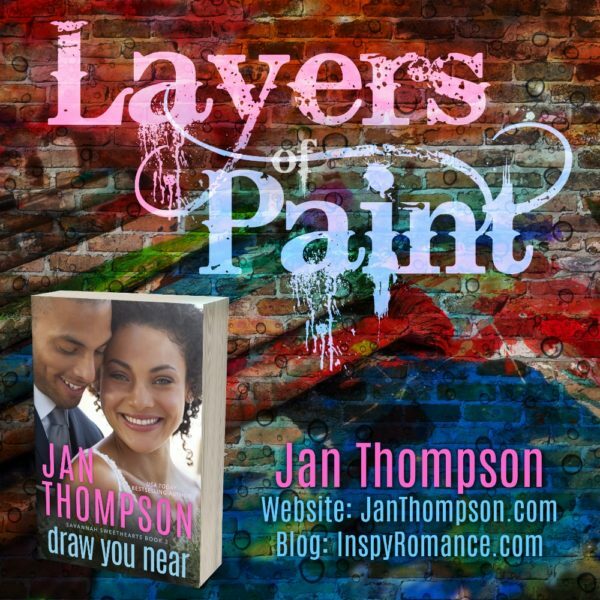 I didn’t really think much about the layer of paint until reading the Tuscan Legacy series, which discussed a special blue paint used in mysterious paintings. My aunt liked to paint and did forgeries or reproductions of famous paintings. I have her reproduction of Vermeer’s The Milkmaid hanging in my bedroom. Draw you near sound interesting and has been added to my reading list. Best wishes and thanks for a thought provoking blog. Jan, sorry failed to edit my post. Copied your question, so I could answer it. In a hurry to get the oldest grandson to school. His father is out of the country on business. Take care. Thank you, Renate, for your comments! Yes, Monet’s paintings are very colorful. I do believe it takes a bit more imagination to appreciate impressionism, though Monet did a very good job. I have a print of a modern day impressionist painting (a regional artist who has passed away, I think) and while the concept is similar, it’s hard to approximate a master painter. That’s cool that your aunt is an artist. I think a lot of time, in art school, they do teach you to learn from the master’s by imitating their art. Even Michelangelo and da Vinci had students who mimicked the master artists. That’s cool that you have a Vermeer copy on your wall. I wouldn’t say your aunt did “forgeries” because that implies a crime! She’s openly painting this. Speaking of art crime, have you read ONCE A THIEF (Protector Sweethearts Book 1)? I have a reformed art thief in that book, and he is helping to solve a case of some Russian eggs that are sort of like Faberge eggs, but another type. Thank you for reading my blog post today! Appreciate it! Hi Jan, I enjoy art- not modern art, more Impressionist art like Monet. I was privileged to see an Impressionist exhibition at the National Gallery once. However, I do not really see layers etc. I just enjoy what I see- I don’t really dig into it. My husband does pottery and I enjoy that also. Lars should definitely not give up his quest!! Thank you for your comments! Yes, the National Gallery is on my bucket list. I haven’t traveled that far yet (so many places to go). Thank you again for commenting! Have a wonderful day in the Lord! I enjoy looking at art but don’t analyze it. I enjoy your books. Thank you for your comments, Diana! Yes, sometimes I look at art for the color and how well it goes on my wall (or not). I don’t overanalyze it or I’d remove it from the wall because there’d be too much going on in it LOL. 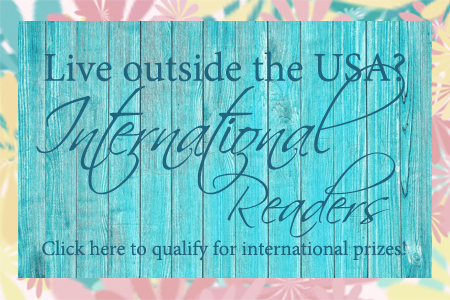 Thank you so much for enjoying my books! I mentioned in another comment that I’m writing Book 7. It’s in revision now and almost done, but I had to take time out to clean out my son’s bedroom (he went off to college and we want to repaint the walls). So there’s a bit more delay in getting Book 7 to my editor, who is already waiting for it! I hope to get it to her soon… Maybe October. I love art! I love admiring the beauty of the painting and experiencing the emotions it invokes in me. Sometimes, I do try to understand it and it’s meaning, but that is always up to interpretation. But I do believe all art has meaning, whether it’s something simple or deep. Thank you, Chanel, for your comments on art! Yes, I agree re: interpretation! Sometimes I see some super interesting art on Pinterest and I thought there is so much meaning in it, but someone else said it was nothing! It made me laugh because in DRAW YOU NEAR, Lars does the same thing. I admire art, but I trully such at any form of it. I have a friend who draws, paints, knows how to play any instrument and is a tattoo artist. All I can say is hats off. That’s a lot of artistic talents right there that your friend has! I am not good at sketching or painting people, but I can do still life with pencil or oil pastels. I think it’s easier to paint still life because they don’t move, and if the apple is not “exactly,” it doesn’t matter LOL. I can say it’s ART. Glad you appreciate art! That’s more important than being able to do art. God Himself is the ultimate Artist, and I see a lot of artwork all around us in nature. His brushstrokes! Thank you again for commenting! wow! this sounds so good! Even though it’s book 2, it sounds like it can be read separately, right? I’m a budding artist… well, not really. I used to watch Bob Ross as a teen and always wanted to paint, but never had the funds to buy all the supplies. Just last Christmas, my wonderful husband bought me a Bob Ross kit, and I’m learning how to oil paint finally! I can’t get into watercolors. I’ve tried oil pastels, colored pastels, & crayons of course. ;) I like to Bible journal and color with colored pencils best. I also love to make collages with my scrapbooking supplies. I don’t usually analyze too deep once I’m done, except to notice where my technique could be improved. Thank you, Lila! It’s Book 3 in the series. Yes, you can read it on its own, although characters from Books 1-2 and the prequel do show up here and there, making cameo appearances. However, DRAW YOU NEAR has its own self-contained story about Abilene and Lars. Abilene’s brother, Dante, will have his own book in CHERISH YOU SO (Book 4). Oh Bob Ross was fun! Every now and then I see his memes floating around and they are hilarious! I saw videos of him painting, and wow, that artist can surely make art look so easy. I don’t know if I can do it myself, to make the painting show up amazing like he did, but then it will be my own creation, I’m sure. Like other artists! That’s cool that you’re picking up art too! I have several boxes of old crayons (from my son’s kindergarten days) and I wondered if I could paint something with them. They still work, and the colors are still brilliant, after all these years! That’s amazing that you do scrapbooking! I know that people say it’s fun, but I tell you, it looks really hard to me! I guess my brain might not be wired for collages! I see some really nice ones on Pinterest and I say that doesn’t look too bad, and then when I try it, it looks like a WRECK! I think it’s great that you have the ability to do scrapbooking. That is indeed an art form to me! this is a fun post. I think I am a bit of both depending on what i am seeing, where i am emotionally at the time, etc. Thank you so much, Lori, for your comments! I’m glad it’s a fun post! That’s true re: depends! Also, I don’t know if it makes sense, but if I go to the art gallery, and it’s raining and I have to find parking and get all wet and all getting inside the building, it does put a bit of a dampener on the mood. Haha! So yes, I agree that art appreciation depends on the situation. Thanks again for commenting! Have a wonderful day in the Lord! I read nothing into art work. I’m not artistic and only see blobs of color or scenes, depending on what is there. It amazes that some do, but that the beauty of how God created us all so different. Yes, indeed! God has created each of us in a unique way! I love all kinds of art, except Abstract, because I just don’t understand it! My favorite type is Classical, I think. One where you can clearly see, true to life, what the artist saw while painting. Classical art is beautiful IMHO! Good choice! I’d have to say modern art is my least favorite, and sometimes abstract art (unless it’s very colorful) leaves me feeling confused. My favorite medium is watercolor, but I like most other types. Thanks for the opportunity for the giveaway! I have the ebook Smile for Me, so I’m looking forward to adding more of your writing to my collection. Watercolor can be beautiful! In Book 3, Abilene also does watercolor. Usually of natural landscapes. Sometimes modern art can be interestingly colorful. But I hear you re: abstract confusion. Yes, it can also be dizzying to look at LOL! I enjoy walking through an art gallery. We visited the Louvre and the Musee d’Orsay while in Paris. I loved seeing the Degas. All three of my girls are artsy so we love touring museums. That’s wonderful that you were able to visit Paris! I’ve never been there, but many years ago The Louvre sent paintings on tour, and I was able to see some artwork in the temporary exhibition. Degas’ ballerina painting is memorable to me! I love outdoor scenery art. There is nothing more beautiful than God’s creation! Oh yes! Landscapes, outdoors, lovely nature… They would make wonderful paintings, won’t they. I do agree that God’s creation is beautiful indeed. Thank you for stopping by and for commenting! Hey Jan, I am an art dolt. I don’t understand it. I can’t tell the difference in bad art and a masterpiece. Some masterpieces look like someone splattered paint everywhere to me. I do like the ones that make sense – that actually look like something – not abstract. I do respect artistic talent – I just can’t discern it. Thank you for your comments! Appreciate it! Yes, that can happen re: good versus bad art. Like they say, “beauty is in the eye of the beholder.” Sometimes it’s subjective, really, to both the viewer and the artist! I prefer more defined paintings myself. Sounds very interesting have never read but I love to read Thanks for the chance! Welcome to my Savannah Sweethearts story world! Actually it even has 2 more spinoff series (Vacation Sweethearts and Protector Sweethearts) and two sister series (Seaside Chapel and one more to come in the future). I hope you enjoy reading the stories! I like art but try not to over analyze it. I don’t think it’s meant to be understood LOL! Now in another book of mine, a prequel, Ask You Later, I explore this angle of modern folk art not always looking like art. I didn’t label the book as romantic comedy since it is deeper than that, but I took some liberty with my main character’s comments about the other character’s art… I won’t give away any spoilers but let’s just say that she doesn’t think too highly of his abstract creativity! I don’t tend to overanalyze art. My mom is very talented and loved to paint (mostly pastels) but most of her work is very straightforward, landscapes and still lifes… So I didn’t grow up with anything abstract or hard to understand. I just know what I like! That’s amazing that your mom is an artist! My mom loved to sketch and paint also. She is unable to do it anymore since her stroke. But some of us children have inherited a bit of her artistic abilities. Thank you for commenting and for stopping by!